Clusters of galaxies are the biggest objects known in the universe. They consist of large groups of hundreds of galaxies that each contain hundreds of billions of stars. The member galaxies are embedded in a cloud of hot X-ray emitting gas that spans over millions of light years. During the formation of clusters, a large fraction of the chemical elements that supernova explosions produce is ejected from the galaxies into the surrounding hot gas. In this thesis, Jelle de Plaa presents the results of his study of this chemical enrichment of the hot gas. 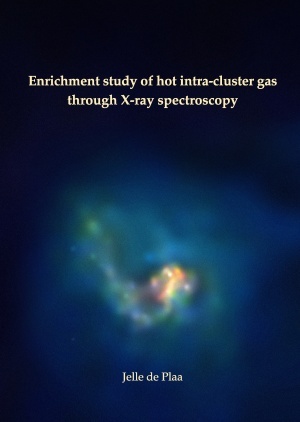 He used observations performed by ESA's XMM-Newton X-ray observatory to measure the abundances of several elements and compared them to supernova-model yields. The printed version appeared on January 16th 2007. Download here the PDF version of the thesis. Preview the thesis through Google Books.